2010: “Ghost Train” hunter Christopher Kaiser, 29, of Charlotte, North Carolina, is struck and killed by a Norfolk-Southern locomotive on a tall bridge near Statesville while listening and watching for the ghosts that reputedly appear each year on the anniversary of the 1891 Bostian Bridge tragedy. On this day in 1891, a passenger train jumped the tracks on the 300-foot-long bridge, sending seven rail cars off the span and approximately 30 people to their deaths. 2009: Division II Saint Paul’s College (Lawrenceville, Virginia) is forced to cancel its season-opening football game—scheduled for August 29 vs. West Virginia Wesleyan—because the helmets and pads ordered for the team’s players fail to arrive. 2009: The Dutch national museum announces that one of the pieces in its collection—a rock supposedly brought back from the moon by U.S. astronauts—is nothing more than a piece of petrified wood. The museum acquired the object following the death of former prime minister Willem Drees in 1988, who received it as a gift in 1969 from then-U.S. ambassador J. William Middendorf. The so-called rock, which the museum once insured for more than $500,000, is valued at approximately $70. 2008: Bloomberg News inadvertently publishes its obituary for still very-much-alive Apple CEO Steve Jobs before retracting it shortly thereafter. 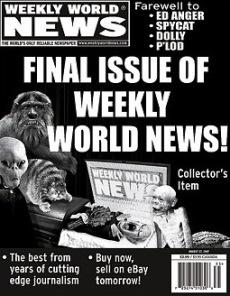 2007: The Weekly World News ("The World's Only Reliable Newspaper") publishes its final print edition. 1990: Blues guitarist Stevie Ray Vaughan is killed in Elkhorn, Wisconsin, when pilot error causes the helicopter in which he is riding to crash into a hillside.